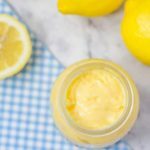 Keto Lemon Curd - Low Carb & Sugar Free Recipe - "Zesty & Sweet"
Our Sugar-Free Keto Lemon Curd recipe is so easy to make! Smooth and zesty yet still sweet, using natural low-carb sweeteners to taste. Keto lemon curd is the ideal condiment or ingredient for many low-carb desserts. In a large heatproof bowl, add the natvia, lemon juice and zest, and butter. Set the bowl over a saucepan of simmering water. When the butter has melted, remove the bowl from the saucepan and ensure that the liquid isn’t too hot. If you can keep your finger submerged for a few seconds then it is cool enough. In a separate bowl, whisk together the eggs and yolks. Pour the eggs into the lemon mixture while whisking, until all ingredients are combined. Place the mixture back over the saucepan of simmering water and whisk continuously until the mixture thickens. Remove from the heat and continue to whisk for another 10-15 minutes while the curd cools. Pour into a clean jar and place cling film directly onto the curd. Place the jar in the fridge for at least 4 hours to completely chill before enjoying.